Jet seems to be in a growth spurt, especially in height. She can still wear a size two sundress – but now it fits her more like a shirt. Her fine motor skills have also developed to the point that she has begun to try to write. Watching her tackle the concept and execution of a straight line was fascinating. Surprisingly, straight lines took longer to learn than circles, which she appeared to conquer almost overnight. After breakfast one morning, Jet asked me to write the names of her family members, animals, colors, and other groups of words. She pretended to write them too. She was most fascinated with her own name and the letter J, of course, was the one she wanted to write most of all. Happily, the first letter of her name can be reduced to 2 straight lines and a half circle, so she already had all the ingredients. Putting them together in the right way, however, was a challenge, but her occasional successes were thrilling to both of us. Jet’s big breakthrough came when I asked her to follow my finger as she made her letter. I could almost see the moment the process began to make sense to her! 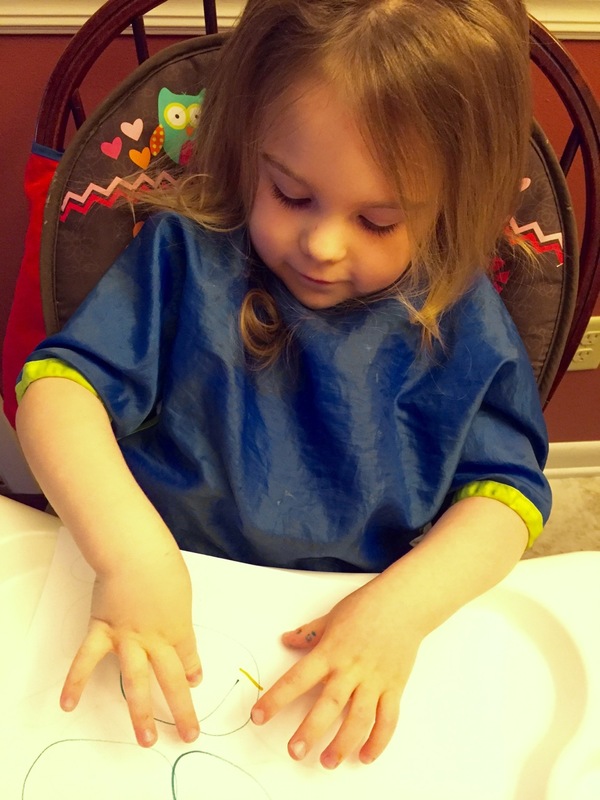 As she used a Fisher Price Magna Doodle to demonstrate her new skill to her mother, she realized that I wasn’t helping her with my finger anymore – she had done it herself! “I made a J! I made a J!” she shouted, and my heart lifted with the gleeful sound in her voice. Her first official “signature” was written on the birthday card she made for her Papa the next day. 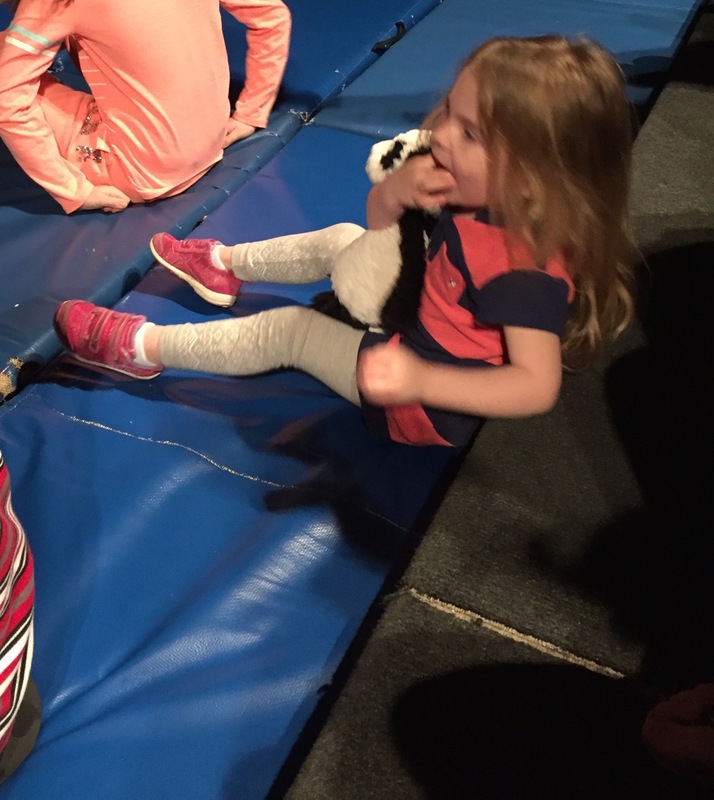 Jet’s mother, aunt and I took her to her very first play, Charlie and the Chocolate Factory last Sunday. Jet’s mother played Mrs. TeaVee in the same play on the same stage in 1997, so I was quite caught up by both fond memories and the excitement of seeing a member of the next generation attend her first play! Jet’s theater manners were excellent and she showed no fear when the lights were dimmed. The plot was much more complicated than I remembered but she caught on exceptionally well. She was even able to imagine the invisible squirrels that dragged Veruca Salt off the stage via a pretend garbage chute! Afterward, she collected two autographs from the cast – a long-standing tradition of the Children’s Theater attendees. Jet also passed a sad milestone this week when she experienced personal loss through death. 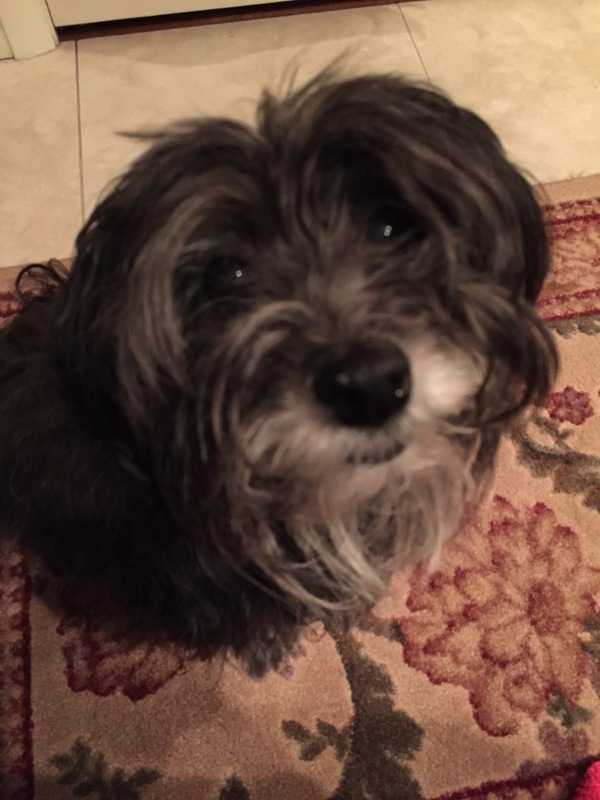 We frequently encounter many of Jet’s friends on our walks including trash collectors, street workers, the “mailmam,” other walkers and most especially, her dog friends, Lola and Bella. These two small and friendly neighbor dogs greeted her enthusiastically but gently whenever we passed their house. They would come to the edge of their electronic fence and wait for Jet to come close enough to shower them with affection. On Tuesday, however, only Bella stood in the driveway waiting for Jet. Our neighbor shared the sad news that Lola had become very sick and died. He said she was in heaven. Jet could see that our neighbor was sad and she was worried. Jet once found a rabbit that had died in our yard but she’d also had a friend whose grandfather died and went to be with Jesus in heaven. Jet worried about the situation for half a block. She wanted to know if Lola could come back or if Jesus could bring her back. She worried that her dog, Garko might die. She worried that if Garko or Marcy, my dog, died that we didn’t have a spare dog like Bella to help fill in the gap. I tried to respond simply and carefully, but when she began to worry about family members dying, I stopped and picked her up. “Look at me, Jet. I don’t want you to worry about this any more. Dying is a part of life. It’s the way the world works, just like the way leaves die and fall off the trees, but you don’t need to worry about this right now. No one is going to die today. You don’t need to think about this any more today.” She nodded and I put her down. We walked.